35 Years Since The Worst Movie Of All Time - The Redeeming Features Of "Sgt. Pepper's"
Music & Travel. By New Zealand radio announcer & travel/entertaintment writer Tim Roxborogh. 35 years ago this week a film many regard as the worst in movie history was released. Which is no mean feat considering it was produced by one of the sharpest showbiz svengali’s of the 60s and 70s Robert Stigwood, that it featured the music of the Beatles and starred A-listers of music and comedy like the Bee Gees, Peter Frampton, Earth Wind & Fire, Aerosmith, George Burns and Steve Martin. And Alice Cooper, Tina Turner, Heart, Curtis Mayfield, Frankie Howard, Billy Preston etc etc etc. Sgt. Pepper’s Lonely Hearts Club Band was quite likely a great idea on paper. The songs of the greatest band of the 20th century, brought to life 10 years after the fact by the then current biggest names in pop-culture. Unfortunately somebody decided a dialogue-free, virtually plot-less script was the way to go. And that no amount of high-camp was ever going to be enough – more camp please! The film was uniquely (and even entertainingly) dreadful, but the simplistic narrative tells us that it killed the careers of all involved and that the accompanying soundtrack was a disaster too. Facts have such a frustrating habit of ruining stories, especially for those writing rock ‘n’ roll biographies. If you are a music journalist, for reasons of nothing other than laziness, things are meant to follow a neat and tidy narrative. It’s too wordy to point out many involved in Sgt. Pepper’s survived and even thrived. Sure, Frampton’s career wound down, but being he wasn’t a prolific songwriter that’s hardly surprising. Remember his biggest selling album – one of the biggest selling LP’s of the 70s – wasn’t a studio recording, but a live album. Frampton Comes Alive captured a moment in time, but it wasn’t representative of an unstoppable musical force. The point being, Frampton’s career wasn’t ruined by being in Sgt Pepper’s. It was more affected by a serious car accident not long afterwards and his ultimate slide would have most likely happened regardless. As for Aerosmith, well they are arguably just as popular now as they were in the 70s, Earth Wind & Fire’s reputation as one of the finest soul / R&B ensembles ever remains entrenched and George Burns and Steve Martin had long and varied careers with Sgt. Pepper’s nothing more than a pleasant blip. But what about the Bee Gees (who it is important to note had to do the film as a contractual agreement)? Considering their next album Sprits Having Flown has now sold anywhere between 20-30 million copies, it didn’t immediately damage them. Sure, there was a massive backlash against them as the 70s gave way to the 80s, but as I’ve written before, that was more due to subtle racism, homophobia and overexposure than having been in a bad movie. Regardless, ask Barbra Streisand, Dionne Warwick, Kenny Rogers or Diana Ross if it ruined the brothers Gibb career? With all four acts achieving career highlights in the 80s as a result of the Bee Gees songwriting and production it’s fair to say the curse of Sgt. Pepper’s has been overstated. And we can’t forget all the post-Pepper’s hits the Bee Gees had themselves either, which on top of the Spirits Having Flown material includes international number ones like You Win Again (1987) and For Whom The Bell Tolls (1993) as well as top 10s such as One (1989), Secret Love (1991) and Alone (1997). None of this mentions perhaps Sgt. Pepper’s most significant saving grace: the Bee Gees took time out of filming one afternoon to write three US #1 hits. You read correctly. Too Much Heaven, Tragedy and younger brother Andy’s Shadow Dancing were all written on the same day and collectively topped the Billboard charts for 11 weeks. Regarding the actual (and admittedly underbought) soundtrack to Sgt. Pepper’s, here are two of the LP’s solo Gibb contributions. First is Robin’s US top 20 hit Oh! Darling and second is Barry’s A Day In The Life. Of course it’s quicker to say the soundtrack was diabolical, but short and speedy narratives shouldn’t be the objective of music writers. Heaven forbid the soundtrack might be semi-decent! Produced by the great, original Beatles producer Sir George Martin, the songs are below. 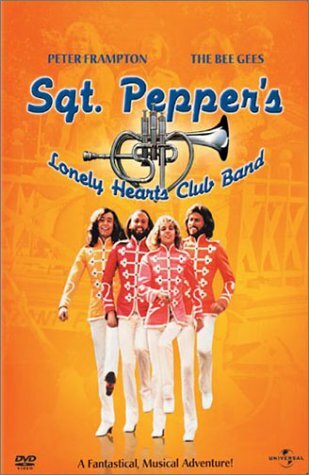 Hi Tim thanks for posting this article on the Sgt Pepper’s film which I found very interesting. Have been a Bee Gees fan since 1967 and am still pleased to be able to see videos I have never seen before, such as Barry singing A Day in the life. Thank you, I look forward to your postings always.